MDG recently took part in a RIBA footbridge competition in association with Network Rail. Network Rail was seeking new ideas to help inform Network Rail in their design and installation of fully accessible pedestrian footbridges across the UK rail network. The competition was open internationally to practising architects, structural engineers, civil engineers or teams thereof, together with students of these design disciplines. In doing so, the selection process was seeking ideas to contribute towards and influence new standard designs rather than a solution that will necessarily be implemented. 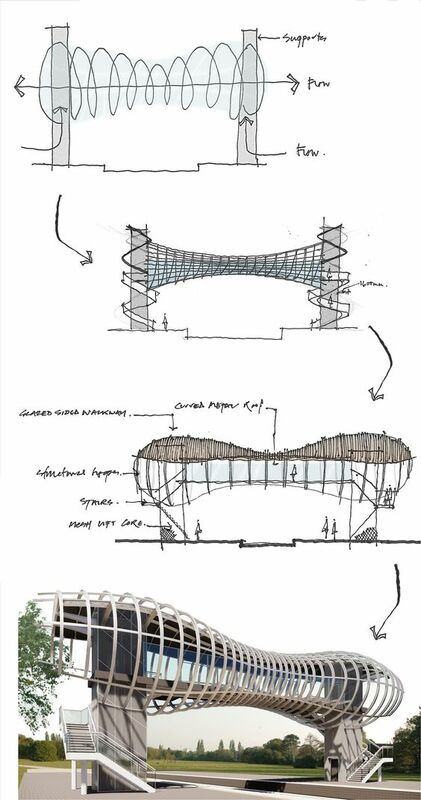 Our approach when designing the footbridge was to pay homage to the bold industrial heritage synonymous with the Victorian steam age. Boundaries of design were being pushed ever onwards with expressive structure such as that employed on the Forth Bridge. The bridge no longer had to be purely functional and was viewed more as an expressive work of art that celebrated a golden age of transport. This became one of the key drivers to our approach. With the arrival and current expansion of high speed rail a new era of travel is dawning. With this in mind, the design of the mundane footbridge can and should follow suit. The simple function of crossing the rail line is enhanced with a design that is progressive, elegant and logical in its form yet still retaining the DNA of its forebears. The strong structural design of organic, skeletal like hoops not only makes the form distinctive but creates a dynamic language that flows over the track and between the lift cores at each end. The structure can easily be erected off the pedestrian walkway from which they take support. These hoops can also carry services and lighting between platforms, but their primary function is to support a roof covering both walkway and stairs. If erected without the roof, as may be required, the architectural language remains. Anchoring the bridge to the ground are the lift cores. These are clad with open mesh. It is envisaged these will be lit from within, maybe with coloured light. Not only does this perform the function of lighting the open staircases but also adds to the artistic expression of the bridge. Additional art will be applied to the walkway glazing in the form of etching which could draw its inspiration from the local area, landmarks or history.